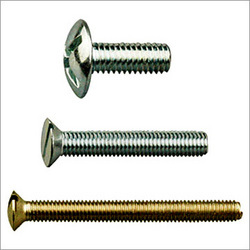 We have gained expertise in providing our clients with a wide range of Machine Screws that is available in various sizes and shapes at market leading prices. All our products are widely used for different types of machines in various industries like chemical, pharmaceutical, engineering and tool manufacturing. Our range encompasses Pan Head, Cheese Head, CSK Phillips, Pan Philips, Round Head, Pan Combination, Stud and CSK Screw. These products can be customized as per the specifications detailed by the customers to fulfill their exact requirements & demands.